When my husband started playing GSF, he commented to me that the tutorial does a lackluster job of explaining the HUD and the UI to you. For example, it makes no mention of the fact that you have both a forward and a rear shield arc - something that seems to me to be somewhat important! 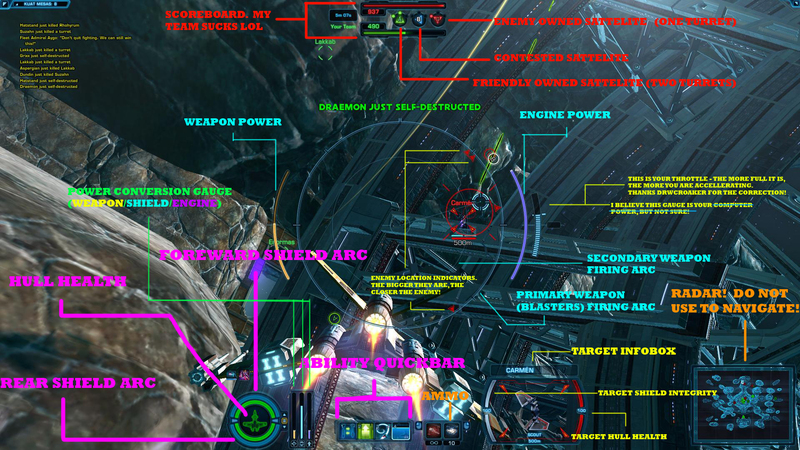 With that in mind, I photoshopped up a visual guide to the GSF HUD and UI. I realize that most people here probably already know everything they are seeing, but new players will not! Please feel free to distribute this among new GSF players or older GSF players who need the help! Also, if I got something wrong, please let me know and I will fix it! Edit: Changed link to updated version, will make a cleaner one later. Thanks Drwcroaker for the correction!